Traditional Cottage Next To The River Isle, with pool, family friendly. A rustic characterful 2 bedroom cottage, set in 16 acres, with swimming pool. 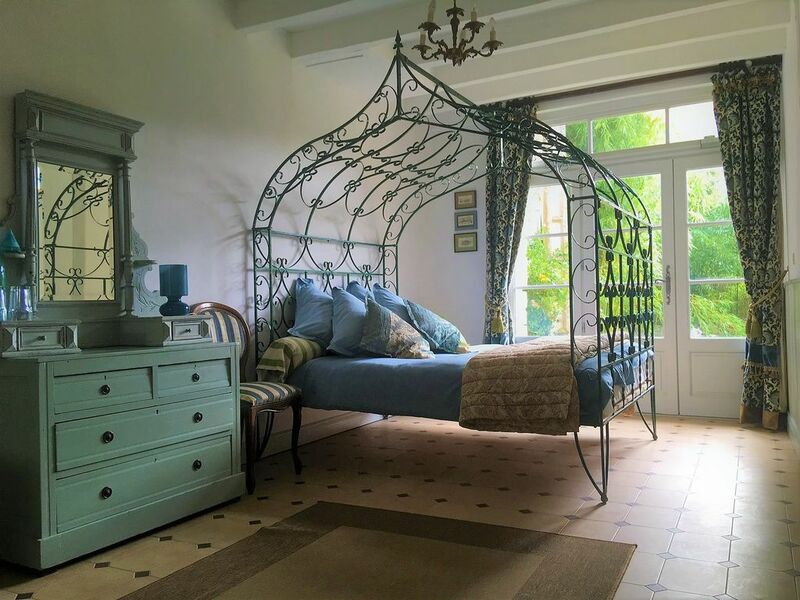 Set in the extensive grounds of a 17th century Manorhouse is our cute and rustic family holiday Cottage in the Dordogne. The cottage has 1 large double bedroom and 1 twin bedroom (+ sofa bed and cots), along with a family sized bathroom. It is perfect for one family. (It should be noted that the swimming pool is shared with our other 4 bedroom gite). The Cottage originally housed the cook/housekeeper, her husband the farmhand/handy man and their children. Now it welcomes four to six guests. The kitchen/breakfast room is traditional in style with terracotta tiles and a wood burner in the hearth. It has the essentials for holidaying with the fridge freezer, gas cooker, microwave and a selection of Le Creuset pots and pans. The antique wooden table easily accommodates six people. The bedrooms are two in number. One has two singles and is airy and bright whilst the double has a unique double bed the likes of which you will never have seen before. The bathroom is also unique and can accommodate a family of four without too much difficulty. Some have said it's a little like a rugby club bath alternatively it could be regarded as Turkish in design. However if showers are your thing it has one of those too. The lounge has a sofa bed, which can sleep two and hosts the television and Skybox so English telly is still there if you need it, along with the WIFI point. There is a selection of DVDs and books to help care for your children if appropriate. Outside is a pub bench for eating en plein air with a parasol if it gets too hot, surrounded by lavender. Opposite in the lean-to we keep the BBQ. The Garden, it's big, some might say too big but it's great for the kids, 16 acres in total. The pool is 10x5 metres in size with a Roman end (curved bit with steps). It is surrounded with a rendered walled garden on three sides and the outer walls of the courtyard on the other. There are gates at either end with a sliding lock and clip to keep little ones out when unattended. There are raised beds all around with exotic plants to make you feel you really are on holiday. Guests are invited to enjoy the salt pool. This does not mean salty like the sea but salty such that you don't need chlorine to keep it clean which can hurt your eyes and irritate your skin. We ask that you use it responsibly and respect the other guests who maybe sharing it with you. The courtyard is surrounded by gorgeous Perigordine natural pierre apparent walls and a pigeonnier. Under the roof of the pigeonnier there is a sofa and a day where you can sit and while away the day whilst enjoying some locally produced vin in a responsible and health conscious kind of way or if you prefer by the bottle. In the centre of the courtyard is a raised pond with aquatics and goldfish, which I believe are closely related to the aforementioned rabbits as they have multiplied so fast. Grassy bits are quite large and we have one patch we have kept mown for large groups, usually with kids who need regular exercising, to use as a baseball /rounders pitch. Positioned outside of the swimming pool there is also a full sized table-tennis table, where many a grudge match has been played on a final night. Down by the river L'Isle there is another pub bench. This is a great spot to watch the river just flow by. We use it for picnics, supporting the local viticulture industry as the sun goes down, swimming and checking up on the local wildlife. Watching aquamarine kingfishers perform low level flying with their underbellies reflected in the water is great. Creeping up on water rats, who have to be the deafest, blindest creatures around is kind of fun. Marvelling at dragonflies making more dragonflies on the wing is incomprehensible but incredible to watch. We have a wooded area of a couple of acres where you can go "on a bear hunt". Only adults with children will understand this last sentence. Here you will see or more likely hear woodpeckers doing what woodpeckers do. Hear cuckoos cuckooing and maybe see herons in flight, which look like aerial battleships to me. We have created a child-friendly play area with a trampoline, a set of swings and cabin on stilts where you can bounce, swing and peek out from respectively. When we arrived here in 2005 we were a family of four which we soon upgraded to five. I (Tony) used to be a hospital consultant, (not that anyone who meets me believes that to be the case), and my lovely wife (Sonia) had a previous life in window display in Central London. On arrival here we put our combined skills into re-inventing “La Feuillade”. Only one child stills remains in our nest as the other two have flown away to University, so keeping him company now is Ruby, a former rescue puppy. We feel we are ideally situated in this lovely part of South West France. If you want to tour around we are midway between Bordeaux and the Dunes de Pyla to the West and Rocamadour, Sarlat, Lascaux to the East, with Bergerac, Perigueux, Brantome, and St Emilion close by. If you have kids to entertain, locally there are cycle paths, a lake beach in the forest, a maze in a maize field, karting in Bergerac, tree top adventures at Laveyssiere, canoeing, and fishing. In our own grounds they can swim in the pool or the river (your choice), play table tennis, run around in the 16 acres, use the trampoline, swings and play cabin. Alternatively you can do nothing at all except watch the banna tree leaves flutter in the afternoon breeze. I believe one of the best features of our home is the space 16 acres affords you. The children can cycle their bikes without fear of traffic or frolic in the play area whilst still in view from the pool. We even have a wooded area where they can make camp. We have around 250ms of river frontage next to the L'Isle so you can sit on one of the picnic benches and look out for a passing kingfisher or admire the dragon flies skimming over the water. Of course we would recommend that this should be enjoyed with some locally sourced beverages, chilled Rosé or Pecharmant as you wish. We also live here full-time so if you want to get some local information as to where the best restaurants are, or which market is the most 'French' we are happy to oblige. We have had our fair share of children and therefore appreciate the challenges that holidaying “en Famille” can provide. We have baby stuff, and for the younger ones age appropriate toys. There is Wi-Fi for the grunters (also known as adolescents). toilet, combination tub/shower, Toilet is in a separate space. Full bed linen provided, including for cots. Available in a communal area for a nominal charge. Bath and Hand towels are provided, please bring your own Pool towels. (These could be provided on request). Tv, Dvd player and Sky Freesat channels provided. A selection of family board games, such as Monoply, Scrabble and Chess are provided. Age appropriate toys are available on request. 16 Acres, trampoline, swing set and cabin. Also a rounders pitch, football goals, and your kids are welcome to bring bikes to cycle in the garden. Available in Mussidan (1km) High season only. Avaiable in saint Front de Pradoux. Available in Perigueux 30km away. A 5m x 10m Salt water swimming pool, with a stepped Roman end, in a walled and gated area to prevent little ones getting in unattended. Beautiful French rustic chic cottage. The Cottage was everything I hoped for in a rustic French chic style. It was spotless and well equipped . The pool and the grounds were stunning. The pool was the best I have ever had the pleasure of using on holiday - it was warm and chlorine free ! The owners Sonja, Tony, Ollie and Ruby the dog made us very welcome during our stay and helped with questions on local activities, shopping etc etc. I stayed in the cottage with my 15 yr old son (v happy with perfectly working Wi-Fi all week !) and our friends stayed in The Barn. We had just the best time and didn't want to leave ! We had a great week's stay in this lovely cottage in Saint-Front De-Pradoux. The cottage is beautifully decorated (immaculate on arrival) and very well equipped with everything you need - all your kitchen appliances, bedding, towels, bbq, plus a few little extra's such as coffee, jam etc. Tony provided us with some bits for dinner and cold beers on the first evening as we arrived so late, which was very much appreciated. Tony & Sonia (& the very friendly Ruby the dog) were great - very welcoming and helpful, great tips about the local area and things to do. Stunning pool and beautiful grounds along with a peaceful river to sit by. Great for kids and loads of space for them to run around. Our 7 & 9yr old girls spent a lot of time either bouncing on the trampoline or in the pool.The local area and countryside around is gorgeous.There is a great bakery and supermarkets a few minutes drive away. You do need a car but lots of beautiful towns to explore and activities within 30mins to an hour drive away, such as Brantome (very scenic and great for canoeing), Bergerac and Perigueux, along with caves, an aquarium etc etc... and the most gorgeous lake for swimming, 25 min drive away. It's set in woodland with lifeguards, cafes etc (unfortunately we only made it to the lake on our last day but we all absolutely loved it and would have gone back again!). Too many things to do, we couldn't fit everything in, including recommendations for the local farmers market.....we will have to go back. I would highly recommend this property. Truly: everything was perfect. Our cottage looked exactly like the pictures we saw, the swimming pool was clean and spacious, the surroundings were beautiful and most of all: there is just so much space! We all just had a lovely time. The only down side I can think of, is that our kids really want a dog now, after spending two weeks with Ruby, the super friendly dog of the owners. What to do? It was really hot, so we'll have to come back for Bordeaux and other city activities. but Lac de Jemaye is great with kids, Castelnaud was quite a drive, but worthwile and there're all kinds of small festivals.. Tony and Sonia are more than happy to give you suggestions! We immediately felt at home upon arrival at the well-maintained Cottage. The listing description is completely accurate: the property is beautifully kept, the beds are comfortable, the furnishings are charming and the facilities are overall great, especially thanks to many thoughtful details such as coffee, olive oil, salt, etc in the kitchen. The dogs got on so well and loved the owners so much, our dog probably would have stayed! Our kids (18, 21) especially enjoyed the sparkly pool, badminton and the table tennis. Thanks to Sonia and Tony for being such attentive hosts and finding a solution to every one of our needs, no matter how bizarre, with a big dose of humour! Thanks for the plentiful suggestions for outings, local events and dining which were appropriate for our lifestyle and interests, not to mention the lovely conversations we shared. We had a wonderful time and have already passed on a recommendation! A gorgeous cottage with everything we needed. Nothing was too much trouble for our hosts who had a wealth of knowledge of the surrounding area and tips of where to go. James especially enjoyed the pool and table tennis, whilst we just enjoyed relaxing in the beautiful surroundings. Everything was easy from the drive from Bergerac airport about 30 mins to the large supermarkets about 5 minutes drive from La Feuillades. We had a wonderful week in the cottage which is just perfect, a rustic, cosy holiday home with lots of attention to detail. The grounds are lovely to walk in and having a river at the end of the garden gives a special touch of charm. I had a look round the barn which has been really tastefully decorated and together with the cottage and pool provides very comfortable accommodation for family groups. Tony and Sonia are lovely hosts, a mine of information on the area and makers of great homemade jam. They also sell fresh eggs and home-grown seasonal vegetables and Sonia has a lovely brocante shop. They make you feel at home immediately. Despite mixed weather we were able to get out and about; many interesting little French towns and markets (Perigueux, St.Astier) being within 30 - 40 minute drive away. We had a day at the beach, walked up the largest sand dune in Europe, Dune de Pilat and relaxed on Plage Corniche followed by a delicious seafood meal in Arcachon. So much to do and see and a cosy cottage and pool to laze by, all you could ask for in a perfect summer holiday. I hope we can come back sometime. Bergerac is nearby and is a pretty town to meander around and have a beverage down by the river. It has been made famous courtesy of a guy with a long nose, alas Monsieur Cyrano is pure fiction but despite this he has a statue in one of the squares. There are many places to eat but it has to be said that vegetarianism is regarded as a bit strange. The buildings are a lovely warm sandy colour and topped with traditional slate roofs they are truly photogenic. You can walk down to Mussidan Bridge and hire a canoe or kayak (in season) and paddle down river and count the kingfishers. Alternatively you can stop at the restaurant just before and spend the next 2 hours eating local cuisine in a truly French environment and at a ridiculously low price. On Saturday you could make it across the bridge to market and get all you need for supper, pique-niques, or if you are feeling more adventurous get yourself a live chicken, pintade or rabbit! Half an hour south is the Dordogne River and if you head east you find more fairy castles than even Sleeping Beauty, Cinderella and Snow White altogether could have ever wished for. It has to be said they are magnificent dotted along the river, sentinels to an age when things were not quite so harmonious between the locals and the Rosbifs. Bordeaux is 60 minutes west and in our view well worth a visit. 'Paris' in the south with lovely architecture, parks, markets, a North African sector to give it an exotique edge. And if you want to indulge in one of the world's top 50 restaurants you have got to visit La Tupina. And for little people there is a fountain parc to wander amongst and cool off. On the way back pop in on St Emilion (or visit in it's own right). Wine is what it is famous for but it is an exquisite town set in acres of vines. You can try a little of what you fancy and then take it home. Not surprisingly there is a Museum of Wine, a hermitage, underground cellars and an ossary. Perigueux is a half-hour away and has to have one of the most outrageous cathedrals with its multi-pepper pot roof. The Romans spent some quality time here and built enormous towers and have a museum for Roman things. It is a great place to wander around (especially the pedestrianised section) and grab a cafe. There are loads of other stuff to do, from checking out the man-made beach at La Jemaye set in a fabulous oak forest (really safe for tiny ones) with a fab wooden play area. Often there is free canoeing and kayaking at the height of summer. A bicycle route which passes by our village goes east and west through beautiful villages, sunflower fields, and intermittently kisses the river, and if you are really up to it you could go to market in St Astier on Thursday morning, and return with your picnic. On a more gentle note. If you fancy a wander in a maize maze field then off to St Martial you should go. The farmer has a play area to entice you as well and gorgeous homemade ice cream. On Thursday evening there is a local producers soirèe where you can buy locally produced food, freshly cooked on site and share your meal with the locals sitting on benches around long tables. Idyllic. Then to cap it off you can have a round of football golf. This is not obligatory. Half between us and Bergerac is Accrozarbes. If you like heights and walking in the trees this place is for you. Very close by is the Saut des Anges. Set down a track in the middle of nowhere is this horse riding stable. You can instruct the owners as to your capability and go on a hack in to the woods. Stroking carp at Le Bugue and descending into caves in a bucket for five. Every day is market day somewhere to get all you need to have a splendid gastronomique experience. A little further away is the Dune de Pyla, the largest sand dune in Europe. I was a little sceptical before but it really is spectacular. It is enormous and stretches south with the Atlantic down below. If fishing is your thing then the L'Isle has sander, perch and even pike. Close by there is a carp lake and a trout farm. Booking Notes: Please see calendar or check the availability with the owners by phone or email. A deposit of 25% will secure a booking, and a statement will be sent showing the balance outstanding. The remaining balance must be paid in full 8 weeks before arrival. If less than 8 weeks remain before arrival, then the full rate is payable at the outset. Changeover Day: Generally a Saturday to Saturday, arriving at 4pm departing at 10am. Although we can be more flexible out of high season, when we will also consider taking bookings for long weekends. Notes on prices: We will be keeping our prices from 2014 the same for 2015.